I just did this on Friday on my E55. To get the cover off you have to take off the nuts with a 13mm socket and 14mm socket (I think those were the sizes). I'll try to see if I can find a picture and circle what needs to be removed. Those two nuts + removing the one screw will allow the cover to come off and get to the other screws for the voltage regulator. Thanks! I have taken off 1 nut and 1 screw on the cover. Is the other nut the one below the original nut in the middle? My socket won't clear the bolt, though, for shame =( I'll keep at it! 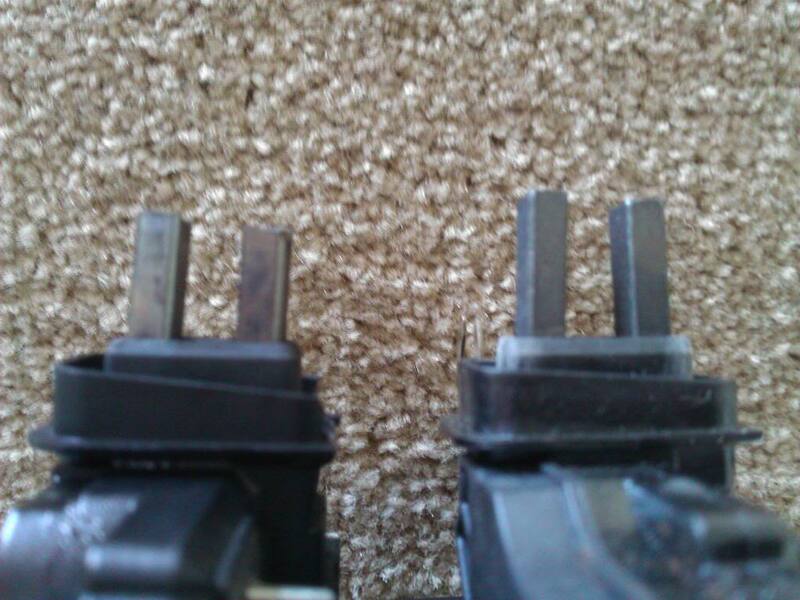 Yeah you remove the power lead in the middle, then there is another nut under that has to come off also. You'll probably need a deep socket to get it off. Hey, thanks again man! I'm all done now I found a deep socket set, ended up being a size 13 for top nut, 14 for bottom nut, and 15 for the nut on the topside. Not sure if the E55 and SL55 are set up exactly the same, but in the end, there were 3 total nuts for the cover + 1 screw. Here is the cover with 2 bolt holes (1 hole uses stacked nuts size 13 and 14) and 1 screw hole. Hope this works. I ran the car for about 5 minutes and it died though. LOL. I'll try again tomorrow and see if the consumer battery will charge up. Thank you very much for this DIY, Loungn14. I fixed my flickering lights (headlights, interior lights etc.) on my 2005 E500 (49,000 miles) by replacing the regulator per your instructions. I bought the Bosh part at aboveallmotorwerkz.com and bought a serpentine belt to throw in the trunk at the same time. Price was $42 for the regulator, $35 for the belt and shipping was free. I just ordered both batteries and a voltage regulator hope this will cure my errors. Does anyone have a write up on everything that will need to be recalibrated and how? Last edited by AMG903L; 07-11-2012 at 11:19 PM. Why these DIYs are not in he sticky? Well finally got a chance this morning to tackle this. Got everything undone, except for the one screw by itself that is holding the volt reg onto the alternator. I did get the other 2 screws with ease. But the angle/leverage cant get to turn the sole screw by itself. Called it quits for now, since its 93 outside and will head to sears/home depot to find screwdriver philips head that will fit into a socket like some torx heads are. Once this screw is out, i think its smoother sailing for me to remove/replace with new VR. No luck got the car up and running and still have the red battery light. Front aux battery not charging, sitting at 12.6v while rear goes to 14.0...so probably the aux relay cable is bad. Taking it to get diagnosed at my indy shop Benz Elite. I am thinking I am going to try this. My lights dim at idle (badly) and I haven't started the car without seeing the "convenience functions disabled . . . " in like 2 years. Now its just getting worse. Before it would still barely hit 14.2, now it barely gets up to 13.3. Hopefully helps, because both battery's are good, but will replace them after this anyways just to be sure. Eddie and Emil were both MB mechanics. You will be in good hands with them. They should be able to tell you what is wrong. Please keep us informed with the outcome. They installed all of my mods that i couldnt do myself. 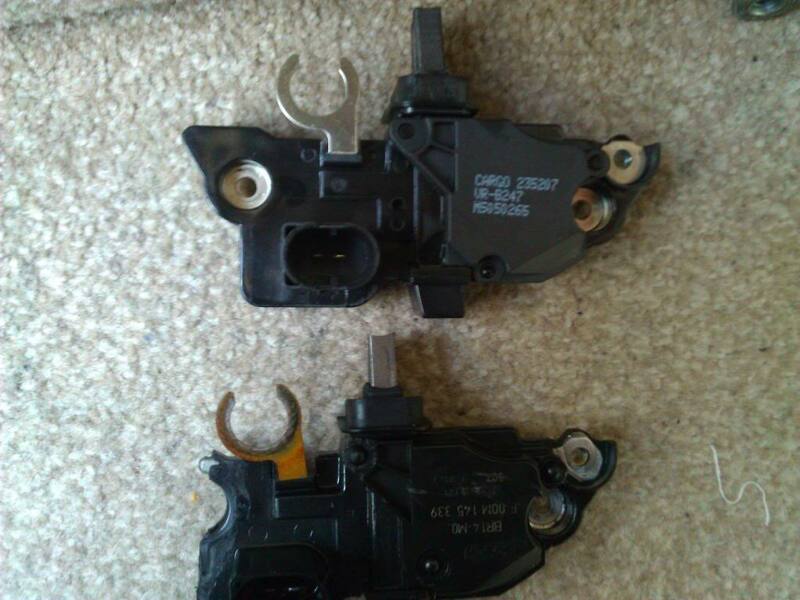 Update: Replaced the front battery isolator relay and viola!!! No more Red Battery CEL CODE!!!!. New voltage regulator and pretty new battery relay. Both batteries are getting charged as they should. Thanks again MBworld and Craig (Chawkins) for the relay and BCM. Didnt need the BCM but have it as a backup/spare for either W211s i own. I've gotten the connector harness thing off, I've removed the black cap and unbolted the 13mm nut. I don't know how to get the main black cover off....there's only one screw, right? I can only make out one screw and its west of the middle as you look at it, right? I've unscrewed it to the point now that it just spins with no resistance...shall I put out on some puffy gloves and pull the thing off, or is there something I've missed somehow? loungn14, great write up and thanks for making this information available to us. I changed mine today - voltage at the rear battery with the car on at idle is now a very healthy 14.2v, whereas before it was 13.6-13.8. Might need a new battery but ya looks like it was needed! I ordered a voltage regulator, sure hope that is the problem. I went to drive my car right before I was flying out of town (leaving to airport 45 minutes later) and got about 3 minutes from my house and the red battery display came up and then I got the conveniences disabled message. I freaked out praying I wasn't about to get a car leaving me stranded on the side of the road right before I had to head to the airport (taxi picking me up). I turned around and raced home and about 1 minute before getting back a message conveniences reenabled or something like that came on. I got to the house and hooked my battery charger to the battery in trunk and it said 75% charged. I jumped in the car and switched to the voltage display and started the car and it was reading 13.4 or 13.5, after this I just let the battery charge for 30 minutes on charger then had to leave to go out of town for 3 weeks so no further investigation. Voltage regulator should be sitting at the house waiting for me and I really hope it is the fix. Both batteries were replaced about 2 years ago so they aren't super old but not new either. Then I guess there is the battery control module as another possible culprit, but praying it is the voltage regulator even though the previous owner of the car said they changed it. They said they did a lot of things and I really have no way of knowing for sure though (no receipts). Last edited by urbamworm; 12-15-2012 at 02:18 PM. I hope it gets solved for you. p.s. your youtube video's are epic! Hello everyone, can someone please provide some feedback on this tread, last night while idling my E55 in the garage I smelled a faint burning scent, popped the hood and could not find nor describe the source of this burning smell, however, after checking the forum on the matter it's come to my attention that the alternator/voltage regulator could be on it's way out, convienience message comes on and off now so i know there is low voltage (11.1v) sometimes a bit less, here's my question,,, if, it is the regulator thats bad, would I still get the burning smell???? Or is the burning smell a clear sign that the alternator itself is toasted internally....feedback please!!!!!!! 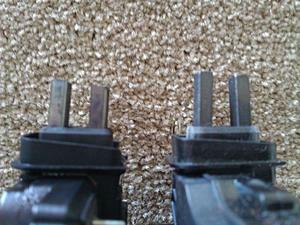 The voltage regulator only has those metal prongs that come in to contact with something inside the alternator. There is no burning smell, they just wear and don't contact anymore causing different readings. I have never personally smelt an alternator either for that matter when they were bad, they would just quit or make noise. I suppose something could burn up inside of it though. When I had the same smell it was my alternator belt. My alternator was on the way out and would not turn occasionally causing the belt to burn and smell. I ended up having to replace the alternator.